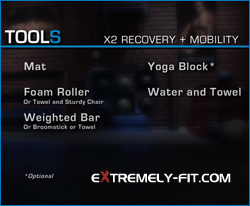 In this P90X2 review, it’s all about Recovery! And in my personal opinion, this workout was the “missing ingredient” to the P90X Workout program. Don’t get me wrong, P90X has the X Stretch workout, and its a great stretching workout… but it was scheduled on your 7th day or rest day. Of course, X Stretch is there for you to do anytime you like, as needed. But the official schedule is 6 days of various workouts, and 1 rest day/X-Stretch. I’m stubborn, I’ll work hard for 6 days, but on the rest day, I want a day OFF. Even though I may need a recovery workout, I just enjoy having one day completely off from workouts. But anyway, when P90X2 scheduled this workout right in the MIDDLE of the week, it was like a Godsend. I absolutely love working hard 2 days then have a recovery workout, then work hard for the last 3 days. Then I still have a day OFF. As Tony Horton says, “it’s a beautiful thing”. You also have the option to add something in too. If you feel good, or feel “strange” not working out 6 days a week, you can add in some cardio. That’s perfectly OKAY too. But with Recovery + Mobility right in the middle of the week, it’s like Tony saying, “You need this… Recover, then give me 3 more hard days”. I like it. I like it A LOT. The entire workout is approximately 57 minutes long. You begin the workout with three Sun Salutations, which lasts approximately 8 minutes. After getting warmed up with the salutations, you move into Leg Swings, Step Back Lunge Twist, Squat Press, and Single Leg Touch Down, all of which lasts about 7 minutes. The next 25 minutes is a Foam Rolling Sequence. This is my favorite part of the workout. Yes, its painful, but it’s also working out the kinks. You work your entire body with the foam roller: Lower Right Leg, Upper Right Leg, Lower Left Leg, Upper Left Leg, Right Inner Thigh, Left Inner Thigh, Right and Left Upper Body, and Upper Back. You may start this workout and not realize you need it, until you get the foam roller on it. It’s crazy. After finishing the foam rolling sequence, you repeat the Step Back Lunge Twist, Squat Press, and Single Leg Touch Down. You should notice increased mobility. Approximately 5 minutes. The last 15 minutes includes: Vinyasa to Pigeon, Frog, Hamstring Stretch, Roller Angel, and Shavasana. Can you travel with this P90X2 workout? Yes. However, in my opinion, without the foam roller it won’t be as good. Let me sum up the necessary P90X2 Equipment Needed. Two words… Foam Roller. If at all possible get a foam roller. If you’re traveling, then you’ll have to use a towel, and can certainly get by with that. Or a smaller foam roller to travel with perhaps. I’d certainly consider that option, if possible. That’s how important I feel the foam roller is. I can not emphasize enough how important this workout is. If all you do is go 100 mph and never stop, then eventually you’ll end up with injuries. This is like preventative medicine. There is no reason in the world not to take full advantage of this Recovery workout, it’s built in to the program, and it works. If you feel like you need more, and must workout 6 days a week, then throw in some cardio. But not at the expense of cutting this workout. Do the recovery AND cardio. My plan is this: I’m going to give 110% five days a week. I’ll earn that Recovery day half way through the week. I used to be guilty of going 100 mph all the time. Now I’m going to take recovery just as serious as I do my strength and cardio workouts. That’s how important it is! So that’s it! A shorter review than usual, but I hope you find the value in this P90X2 review, just as much as you find the value of this Recovery workout. Take a moment to comment. I’d also appreciate if you shared this on Facebook, or used the share options below. Visit our store the very next time you have a need for Beachbody products or supplements. We are an authorized distributor, and appreciate your business! Good luck with P90X2! If you want to read another P90X2 Review, you can find them all by clicking here.